In this review, we’ve cherry-picked the highlights of the event. Continued from part 1. EVM have had a bumper year with increased UK and Irish sales, higher production and a growing export business. Of particular success have been the Community and CityLine products which offer direct wheelchair access. Increasingly sales of these are being made into the mainstream, commercial stage-carriage operators fleets because of their relatively low initial cost, excellent reliability and fuel economy and high residual values. New at the Show was a 25-passenger version of the CityLine – the CityLine 25. This is built on the 5.5 tonnes Mercedes-Benz Sprinter 516 with the seven speed fully automatic transmission. The vehicle has 16 seats (three of them tip-ups in the wheelchair bay) and can additionally carry nine standees. The new model has been developed specifically for stage carriage services. At the other end of the scale was a luxurious Grand Tourer VIP minicoach for regular EVM customer Whites of St. Albans. The Grand Tourer is the only vehicle in the EVM range that is coachbuilt and isn’t produced in Kilbeggan but by Car-Bus in SpaIn. The vehicle was built to a very high luxury standard on a Mercedes-Benz 516 Sprinter with automatic transmission base. It had 16 luxurious reclining seats with some of them set at tables, air conditioning, tinted glazing, comprehensive entertainment system with TV screens front and rear, charging and USB sockets at every seat, mood lighting and a good-sized drop well boot. The vehicle had been built for Whites of St Albans, a regular EVM customer. Also on show was an Avantgarde 16 built for Anthony’s Travel of Merseyside. Again the base vehicle is a Mercedes-Benz 516 Sprinter with automatic transmission. Internal specification was again to a high standard with 16 luxury seats, some set at tables, tinted glazing including glass roof, air conditioning, entertainment system with TV screens front and rear and charging, USB sockets at each set of seats, mood lighting and a large boot. Final exhibit was an X’Clusive EXT. Again on the Sprinter 516 base it featured 19 seats, luxury trim, tinted glazing including a glass roof, air conditioning and a large boot. Mellor Coachcraft showed two examples of its coachbuilt minibus range, the Strata LF and the Tucana II. Being coachbuilt, the Sprinter-based Strata gives an internal width increased by 100mm which allows 2+2 seating to be achieved using 450mm wide seats. 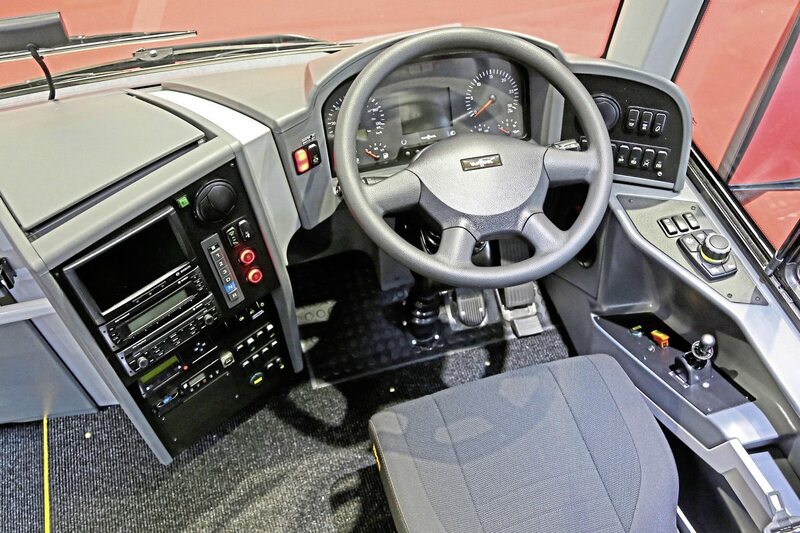 The Strata LF uses the 5.5-tonne Sprinter chassis fitted with fully automatic transmission. The Crafter-based Tucana II had 14 seats and one wheelchair bay. The vehicle can additionally carry one standee passenger. If a wheelchair passenger is carried seating reduces to 11 but the single standee passenger ability is retained. The Strata Low Floor was seated at 21 and again had a single standee availability. When carrying a wheelchair passenger seating drops to 18 and the standee availability is retained. It is actually possible to carry two wheelchairs in the special lowfloor bay. The Strata LF has already found favour with a number of stage carriage operators. 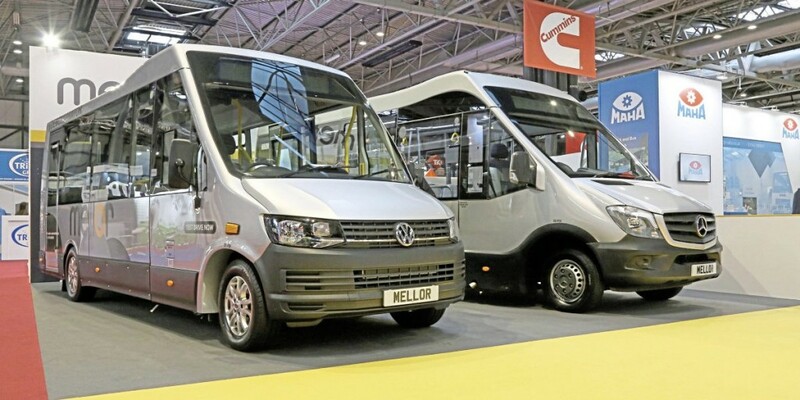 Mellor is gearing up for its first ever appearance at the Kortrijk Show where it will be launching the left hand drive version of the Strata LF. It has already signed up a number of dealers in Europe and Scandinavia. 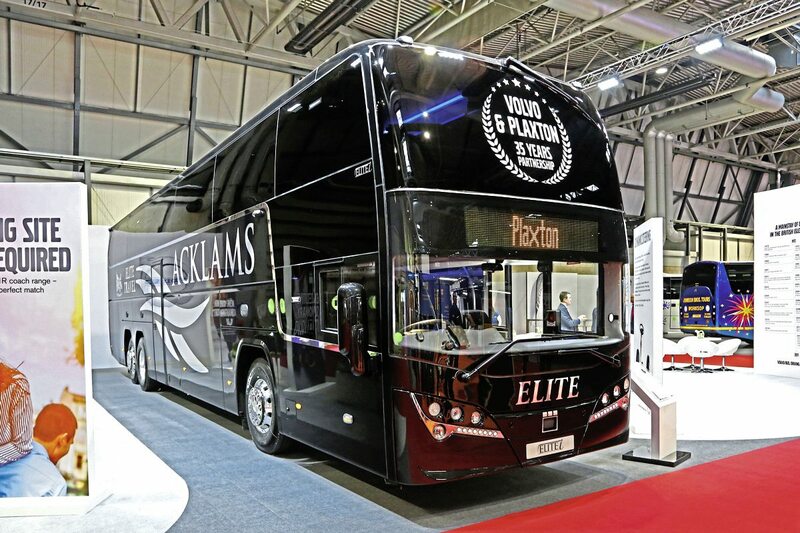 Volvo may only have had one exhibit but it was a big one – a 13.8m B11R 6×2 with Plaxton Elite-I interdeck coachwork with only 42 Kiel 1020 seats trimmed in black and grey leather. The tri-axle chassis featured the D11K 460hp engine and I-Shift AT2412E automated transmission with 600-litre fuel tanks and a 64-litre AdBlue capacity. Destined for use as the Hull City team coach it carried a dark grey livery for Acklams Coaches of Beverley and was finished to a superb standard with additional conversion work by AD Coach Systems. 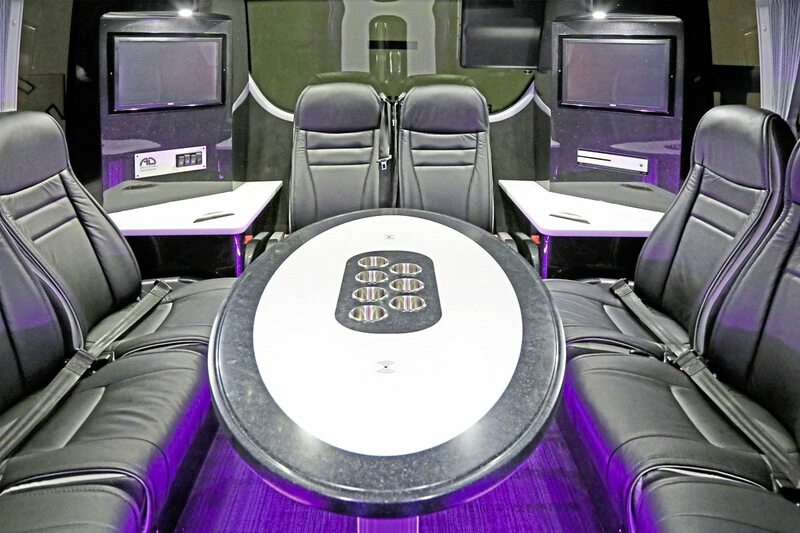 Equipment included an eight-seat rear lounge around a table with Playstations and X-Boxes and monitors in every conceivable location. Tables featured induction charging and the central kitchen and servery was, as several operators noted, ‘better equipped than at home’. He stressed the importance of continually finding new niches, something he felt Volvo was quite good at, citing the recent launch of the 10.3m Sunsundegui SC5 and the 72-seat SB3 on the B8R chassis as examples. He had been pleased with the ‘very positive reaction’ to the subtle changes introduced with Jonckheere JHV2 body which were evolutionary rather than revolutionary, enabling it to come in without undermining the JHV1. Jonckheere had a very loyal customer base and over 100 JHV2s had now been sold with major orders from Travellers Choice and Parks of Hamilton. A fresh branding that will appear across Arriva’s European transport operations from January welcomed visitors to the Arriva stand… as well as some new faces following recent changes. 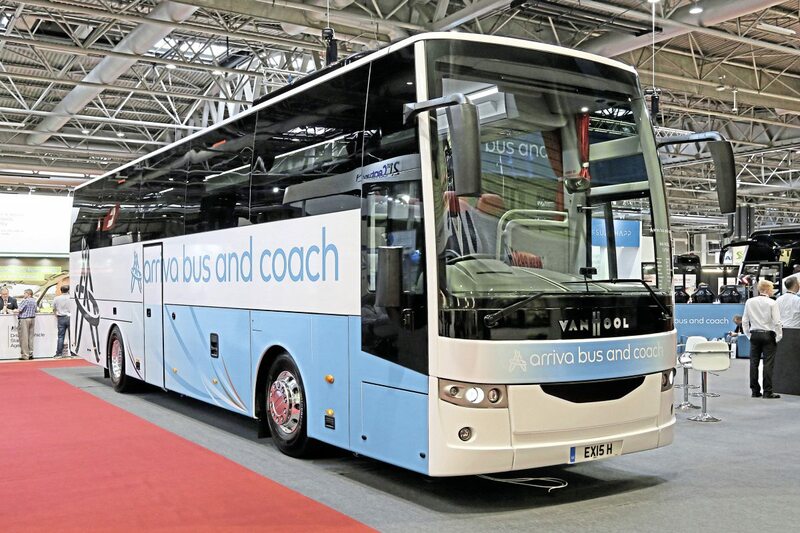 Representing the Van Hool range was a 12.48m long, 3.80m high, integral Van Hool EX15H with 51 Kiel passenger seats in red and grey, courier seat, centre sunken toilet, drinks machine, 435hp DAF/Paccar MX11 engine and ZF EcoLife fully automatic transmission. From Temsa there was a 12.2m Safari HD12 RHD 53 seater with centre sunken toilet and the ZF EcoLife automatic transmission matched to the 360hp version of the DAF MX11 unit. In the demonstration park a Temsa MD9 midicoach in the new colours was prominently sited. Elsewhere in the halls there was a Bluelight conversion of a Renault Master for Arriva Transport Solutions, a Sprinter City 45 on the EvoBus stand and a separate stand dedicated to Arriva’s customer support activities. There has been a desire for some time to bring in an additional Temsa product and after showing the LD13 last year, consideration is being given to offering the attractive Maraton touring coach. There are also discussions about a switch from building the Safari in stainless steel to carbon steel from next year, a move that would make a ‘material difference’ to the price of the product. Ed Potter said preparatory work was being undertaken for the launch of the Van Hool EX16M at Kortrijk and he was hopeful that a launch customer had been signed up. Important staff changes are the appointment of Natalie Kelly as Head of Sales, reporting to Commercial Director, Andy Cullen. She has considerable sales experience gained in the powered lift industry. A new head of Aftersales & Operations has also been appointed. Nigel Clarke will take on the role from mid-November. Dave Gregory is to return to his former role as Business Development and Fleet Sales Manager at his own request. 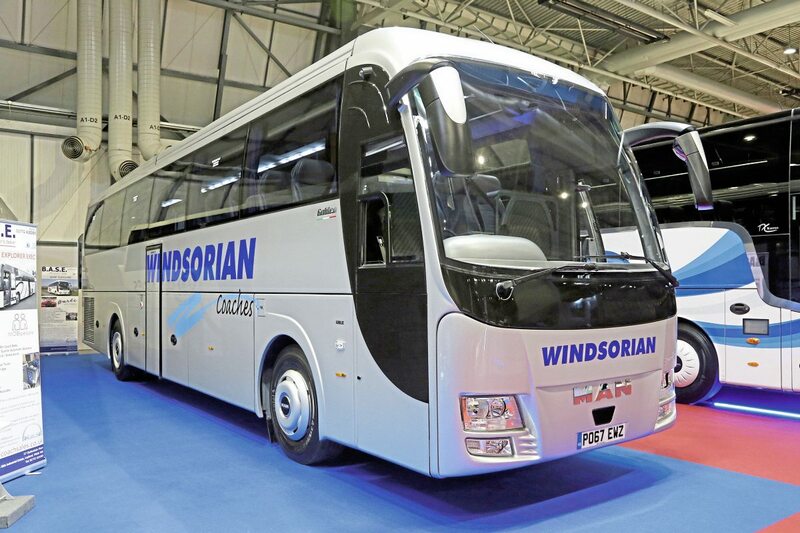 Having displayed the first Barbi Galileo MAN RR2 for Andersons Travel at the UK Coach Rally, the operator’s second example was shown in Birmingham in the silver of the Windsorian subsidiary. This had 53 Kiel Avance seats, a luggage hold capacity of 12m3, a ZF EcoLife transmission and a 420hp engine. The power lockers are an option for an additional £1,500. Since Barbi imports began in May 2015, a total of 23 have now been ordered with forward orders already placed for next year. With the GVW limit raised to 19.5t, BASE is looking at whether there are any new options that can be introduced, though there may not be because the stumbling block is usually the continuing 11.5t limit on the rear axle. Other recent orders include another 65-seater on the tri-axle MAN RR4 chassis for the Holmeswood fleet and a further repeat order from Timberbush Travel for a 10.8m MAN RR2 mounted 47 seater. An automatic box can now be ordered with the RR4 chassis. MobiPeople’s 12.5m Explorer has found a niche in the UK since BASE launched the brand in the UK in November 2014 with the number sold here now over the 50 mark in addition to over 30 Midi Explorers. On the stand was the first built to an executive specification with 57 Kiel Avance Chic 2050 recliners, a 60-litre dash fridge, fresh water centre demountable toilet and Frenzel water boiler. Mounted on the MAN RR8 with 290hp 6.9-litre engine (360hp is an option) and ZF EcoLife gearbox it comes at a net price of £194,000. KB Coaches have now taken four Explorers and ordered another at the show. They can demount the toilet and re-seat to 70 at a later date, though the second door position means that the 74 (3+2) you can have on a new build cannot be attained. 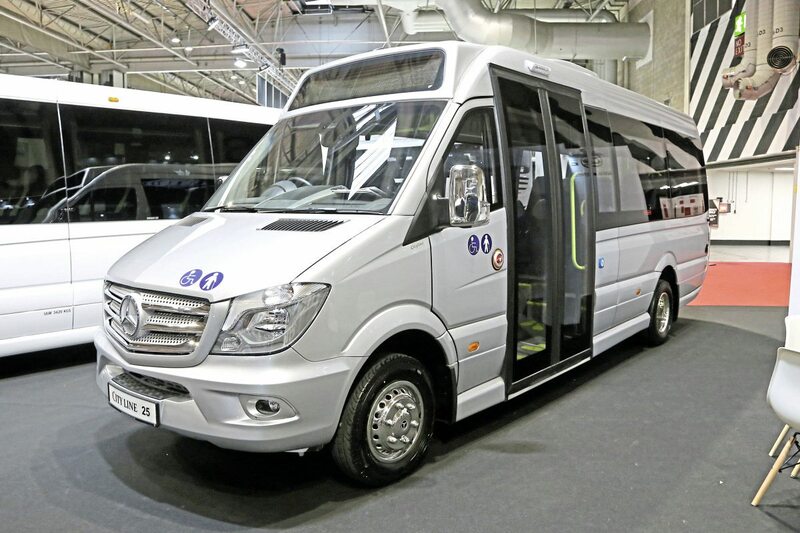 Holmeswood’s own fleet will soon receive a DDA 57 seater with tracking for up to 11 wheelchairs. Recent, minor Explorer changes have seen the exterior mirror layout altered and some obscuration around the screen removed giving the driver an improved view. Outside, an Explorer for Alexcars was equipped with 74 Buckingham Prime seats, this capacity netting at £181,000. Mounted on the MAN TGL 10-220 truck chassis with MAN O8.36 engine and automated transmission, the Midi Explorer can now be supplied with 37 rather than 35 seats if required. The coach shown was a DDA specification 35-seater with a rear nearside PLS Access lift for Jamiesons of Lerwick, Shetland, which is celebrating its 95th anniversary this year. It featured Kiel Chic Avance 2050 seats. Following the production of some Midi Explorers with a 20cm shorter front overhang for a Scottish operator this look is now being adopted as standard making the overall length 8.9m rather than 9.1m. A new boot arrangement on the Midi Explorer introduced last year gives a better departure angle, offers better access and is more aesthetic as well as offering slightly increased capacity, though the old layout, which gives a better departure angle, can still be specified. Net prices for non-DDA 35 seaters start at £134,000 and for the 9.7m 39 seat version on the 12.250 at £143,000.